MBA International invites Mr. Andreas N. Shiamishis for the 2nd C-Suite Series in the context of the course “Entrepreneurship and Sustainable Energy” taught by Prof. Konstantinos Andriosopoulos. The 2nd C-Suite Series lecture, which is devoted to ‘Energy markets developments and the refining industry’, will be conducted on the 16th of April, 2019, at the premises of the Program by the Deputy CEO & CFO of Hellenic Petroleum (HELPE), Mr. Andreas Shiamishis. Mr. Andreas Shiamishis holds an Economics degree with a specialization in Econometrics from the University of Essex and is a fellow member (FCA) of the Institute of Chartered Accountants in England and Wales (ΙCAEW). 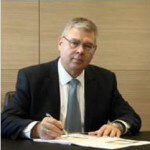 He began his career in 1989 with KPMG in London, specializing in the banking sector and large multinational Groups before joining DIAGEO in 1993, to assume senior Greek and European positions in Finance and Business development. During 2000-2002 he worked as the Chief Financial Officer and later Chief Restructuring Officer in a high-tech ASE listed Company and in 2003 he joined PETROLA HELLAS as Chief Financial Officer. Following the completion of the legal and operational integration of PETROLA HELLAS with HELLENIC PETROLEUM, he assumed the position of the Group CFO in 2005 and became a member of the Group Executive Committee. As Deputy Chief Executive Officer, he is also responsible for business development and the Group’s investments in power and gas. He participates in several Group Committees and Boards. He is a member in various ICAEW specialized faculties, the Board of Corporate Governance of the AMHEC and the Economic Chamber of Greece.